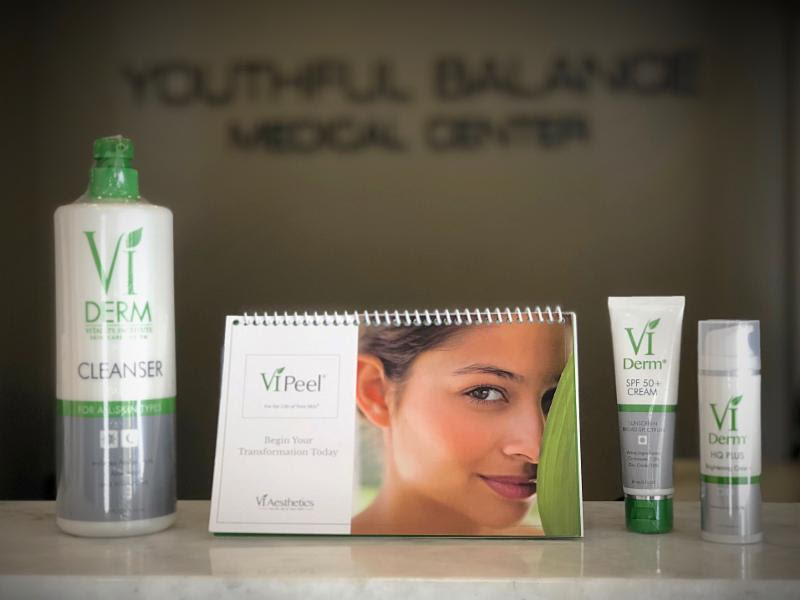 These VI Derm products (which we carry in our Palm Beach Gardens office) can help prolong the results of your VI Peel or to add a fantastic, refreshing new skin care regiment to your day! VI Derm Cleanser* is an aloe vera gel cleanser that will gently cleanse skin and remove residue from makeup without striping the skin of moisture. Suitable for all skin types and exfoliates skin, unclogs pores and softens skin. VI Derm SPF 50+ Sunscreen* protects against both UVA and UVB rays. It is a light, aloe vera based formula, oil free and hypoallergenic. It leaves skin feeling smooth, hydrated and protected. VI Derm HQ Plus* is a powerful and rich treatment cream that will fight pigmentation concerns while inhibiting future pigmentation on a cellular level. This skin brightening formula may reduce discoloration in as little as 4 weeks. The 2% hydroquinone in the formula helps brighten age spots, dark spots and acne scars. Best when used after a ViPeel to inhibit pigmentation from reoccurring.